VATICAN CITY (CNS) — The announcement by Pope Francis that he would attend the World Meeting of Families in Philadelphia in September 2015 had been widely expected, since Pope Benedict XVI had said before his retirement that he hoped to attend the Philadelphia event. Popes typically fulfill their predecessors’ publicly known travel plans, as Pope Francis did in July 2013 when he attended World Youth Day in Rio de Janeiro. The pope’s announcement makes Philadelphia the first confirmed stop on what is expected to be a more extensive papal visit to North America. 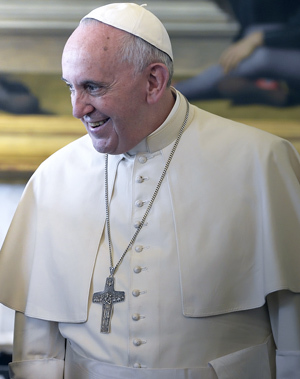 “I would like to confirm that, God willing, in September 2015 I will go to Philadelphia for the eighth World Meeting of Families,” the pope said Nov. 17 in a speech opening an interreligious conference on traditional marriage. In August, Pope Francis told reporters accompanying him on the plane back from South Korea that he “would like” to go to Philadelphia. The pope also noted that President Barack Obama and the U.S. Congress had invited him to Washington, D.C., and that the secretary-general of the United Nations had invited him to New York. Archbishop Joseph E. Kurtz of Louisville, Kentucky, president of the U.S. Conference of Catholic Bishops, welcomed the pope’s announcement. “The presence of Pope Francis at the World Meeting of Families in our country will be a joyful moment for millions of Catholics and people of good will. Our great hope has been that the Holy Father would visit us next year to inspire our families in their mission of love. It is a blessing to hear the pope himself announce the much anticipated news,” Archbishop Kurtz said.